This article was updated at 6:43 p.m. ET. A private suborbital spaceship flew its first solo testflight today (Oct. 10) from Mojave Air and Space Port in California. Though the craft did not reach space, it was a majormilestone for the Virgin Galactic SpaceShipTwo,which flew in glide mode for some 15 minutes once released from its carrierplane, WhiteKnightTwo, according Bill Deaver, an eye-witness of the testflight. "It was perfect landing," Deaver told SPACE.com. "It looked just spectacular." Designed to carry six ticket-holding passengers, thesuborbital spaceship is named VSS Enterprise. U.K. billionaire Richard Bransonis backing the development of the spaceliner, establishing the Virgin Galacticfirm to offer passengers suborbital treks at $200,000 a seat. To date, over 340people have signed-up for flights to the edge of space. There has been a steady progression of testing of thevehicles over the last several months. For example, for the first time on July15, VSS Enterprise flew with crew on board. The first WhiteKnightTwo, christened VMS Eve after RichardBranson's mother, was revealed to the public for the first time in July 2008and started its test flight program later that year. As planned for that test last July, the spaceship remainedattached to its carrier plane -- VMS Eve -- for the duration of the flight, andnumerous combined vehicle systems tests were conducted. Also in that flight,the two crew members on board VSS Enterprise evaluated all of the spaceship'ssystems and functions from end to end in the air. The WhiteKnightTwo/SpaceShipTwo launch system are underdevelopment by Scaled Composites, LLC - an aerospace and specialty compositesdevelopment company located in Mojave, Calif. (about 80 miles north of LosAngeles). Founded in 1982 by Burt Rutan, Scaled has broad experiencein air vehicle design, tooling and manufacturing, specialty composite structuredesign, analysis and fabrication, and developmental flight tests of air andspace vehicles. Perhaps the most radical feature employed by SpaceShipTwo isthe unique way it returns into the dense atmosphere from the vacuum of space. Rutan designed the unique feathering system which does awaywith the need for sophisticated computer driven flight control systems or theneed to rely on the pilots. Instead it uses aerodynamic design and the laws ofphysics for a carefree and heat-free re-entry followed by a glide runwaylanding. 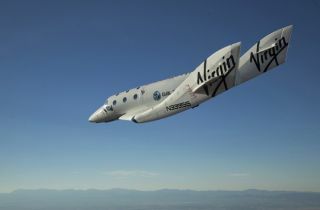 According to a statement from Virgin Galactic, the spaceshipwas released from its mothership at an altitude of 45,000 ft (13,700 meters).From high-altitude drop to landing, the flight of SpaceShipTwo took 11 minutes. During its first flight the spaceship was piloted by PeteSiebold, assisted by Mike Alsbury as co-pilot. ?The two main goals of the flight were to carry out a cleanrelease of the spaceship from its mothership and for the pilots to free fly andglide back and land at Mojave Air and Space Port in California,? according tothe press statement.
? Practice a landing approach at altitude and finally descend andland. Commenting on the successful flight, Scaled Compositespilot, Pete Siebold, said: ?The VSS Enterprise was a real joy to fly,especially when one considers the fact that the vehicle has been designed notonly to be a Mach 3.5 spaceship capable of going into space but also one of theworld?s highest altitude gliders.? George Whitesides, chief executive officer of VirginGalactic was present at the historic flight. He added: ?Now, our challengegoing forward will be to complete our experimental program, obtain our FAAlicense and safely bring the system into service at Spaceport America, NewMexico.? Sir Richard Branson, founder of Virgin Group, was also anon-site eye witness during the first successful solo flight. ?This was one of the most exciting days in the whole historyof Virgin,? Branson explained. ?For the first time since we seriously began theproject in 2004, I watched the world?s first manned commercial spaceshiplanding on the runway at Mojave Air and Space Port and it was a great moment.Now, the sky is no longer the limit and we will begin the process of pushingbeyond to the final frontier of space itself over the next year.? Meanwhile, work is ongoing in readying Spaceport America,the world's first purpose-built commercial spaceport now under construction inNew Mexico. Another major event in the development of personalspaceflight is slated for Oct. 22, when Spaceport America's runway will bededicated. The event will signal the completion of the nearly two-mile long bytwo hundred-foot wide spaceport runway from which theWhiteKnightTwo/SpaceShipTwo launch system will operate. The state-of-the-art launch facility is under constructionnear Truth or Consequences, N.M., and is expected to become fully operationalin 2011. Officials at Spaceport America have been working closelywith leading aerospace firms such as Virgin Galactic, Armadillo Aerospace,Lockheed Martin, Moog-FTS, and UP Aerospace to develop commercial spaceflightat the new facility.